“It’s like getting two games in one!” That should be the sales tagline for Enigma because it’s both a puzzle-solving game and a tile-laying game. Sure, you could buy a puzzle game like Ubongo, or a tile-laying game like Carcassonne, but why buy two when you can get it all in one game? At least that’s how I’d advertise Enigma if I were on their marketing team. Which I’m not. And no one asked me. But if the “two in one” idea works for something as mundane as cleaning products, it should certainly work for board games. Shouldn’t it? There are two distinct phases to a game of Enigma. The first part of the game has you speed-solving puzzles to “earn” your tiles. Think Ubongo-style puzzle solving, except three of the puzzle types are spatial in nature while the fourth is math-oriented. The second part of the game is a tile placement game. During this part of the game, you are laying tiles to build conduits and then placing your networkers within those conduits to earn points. 1. Choose a puzzle tile. 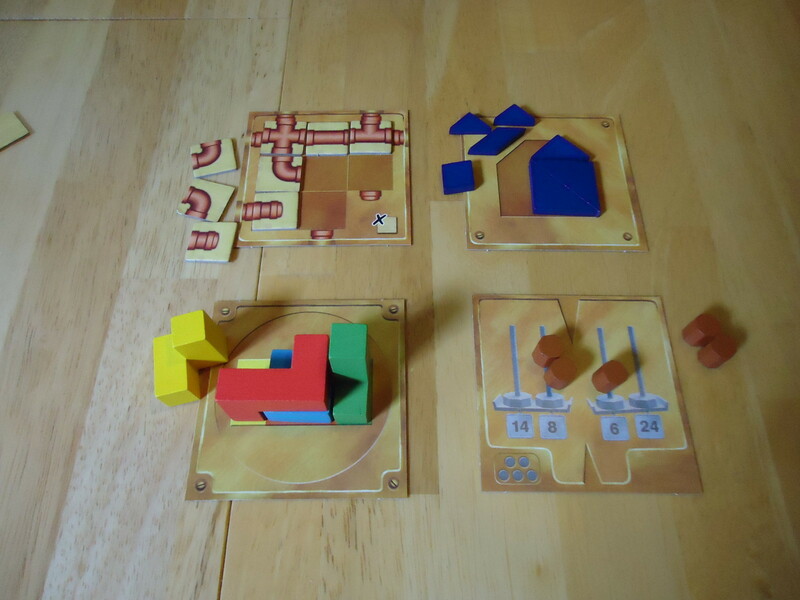 Each player chooses one tile from one of the four puzzle stacks (and also takes the associated puzzle pieces). Each type of puzzle may only be chosen once per round so, for example, if someone else has already taken a tile from the weight puzzle stack, no other player may choose that type of puzzle. Tiles are kept puzzle-side down until everyone has chosen. 2. Solve the puzzle. Players simultaneously flip over their chosen tile and begin work on the puzzle. The first player to complete his or her puzzle turns over the sand timer. 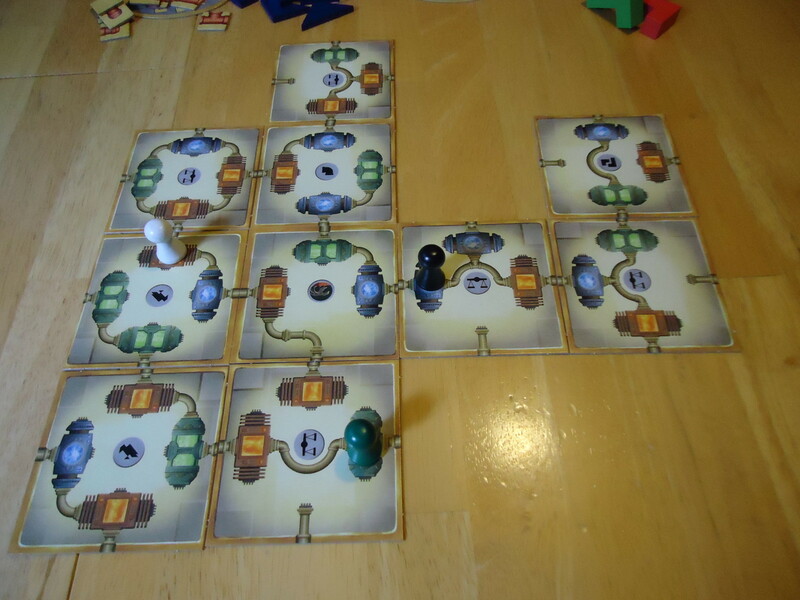 The other players have until time runs out to complete their puzzles. 3. Place the tile. Each player who correctly solved their puzzle before time expired gets to place their tile on the table. Tiles can be placed so that a new conduit is created, or an existing conduit is continued or closed. You can also place a networker on the tile you just placed, but you are not required to do so. You may place your networker on any colored power cell on the tile, provided that there is no other networker already occupying that color inside that conduit system. Players who failed to solve their puzzle place their tile back in the box and their turn is over this round. 4. Score/End the Round. If the tile you place results in a closed conduit, that conduit is scored immediately and all players with networkers in that conduit earn points for each power cell of their color in that conduit. After all players have placed their tiles and networkers and scored any closed conduits, the round ends. If any player has scored fifteen points or more, the game ends. The player with the highest point total on the scoring wheel wins. If no one has reached fifteen points, another round is played and this continues until their is a victor. Is It a Puzzle, a Game, or Just an Enigma? Enigma was a pleasant surprise for me. I thought that I was going to have some trouble with the speed solving aspect of the game because I tend to stink at that kind of game. As much as I enjoy Ubongo, for example, I rarely win. My brain’s just not wired for speed solving, so I expected to lose at Enigma more often than not. I was even prepared for the total humiliation of not earning a single tile and never getting to place a networker on the board. 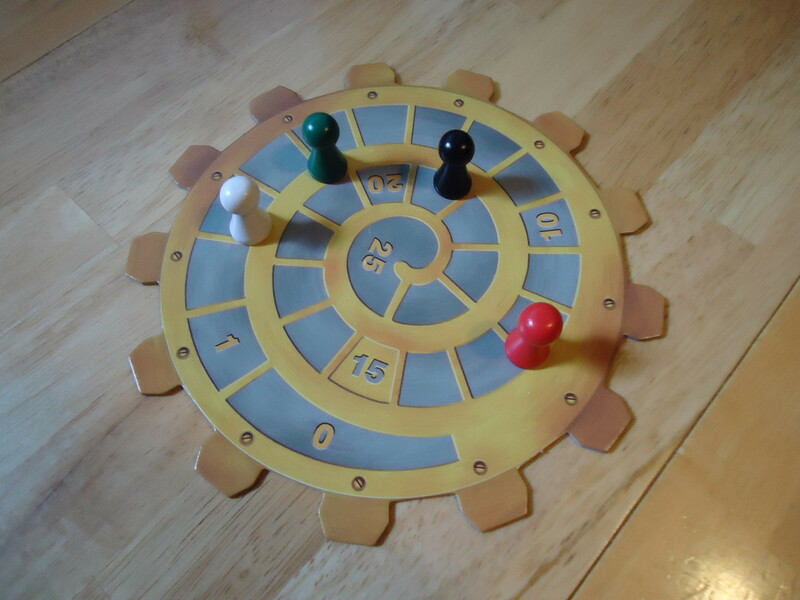 However, the variety of puzzles in Enigma makes for a better balance than in games like Ubongo. Some are very difficult, but some are easier. That’s not to say that the “easy” ones are childishly simple, just that they are solvable even by people like me who have trouble with this sort of thing. Plus, there are four different kinds of puzzles, so there’s a chance that you’ll find something you’re good at. Of course, you may not always get to choose your preferred type of puzzle due to the “no duplication of puzzles in a round” limitation, but even if you get stuck with your most hated puzzle type, there’s a chance that it won’t be one of the super difficult ones. Between the different types of puzzles and the varied difficulty levels, I found the game to be much more forgiving than a game like Ubongo where there is only one type of puzzle and if you have trouble solving it, you’re doomed. There may still be rounds where you fail to solve the puzzle and don’t earn the right to place your tile, but that happened less often than I expected. And even the super-solvers in our group had rounds where they failed to earn a tile, so it ended up fairly balanced. I expected that the super-solvers would have no trouble while people like me would get trounced, so I was very pleased to see that the game is balanced enough to be enjoyable by everyone. I won a couple of games and was close behind in others. No total humiliation occurred! I was also pleased by the sheer number of puzzles. I was afraid that this would be the sort of game where you’d be able to memorize the puzzles over repeated plays, eventually making it unfair to bring out with new players who’d never seen the game, or killing the long term replay value. I doubt this is a problem. There are a lot of puzzles in the game and, unless you’re playing Enigma day in and day out for weeks (or working the puzzles in your spare time for fun), you’re not going to memorize much. While you may be temped to relax after you solve your puzzle, your work isn’t done and this is the appeal of Enigma. Many puzzle games stop when the puzzle is solved. Enigma keeps going because now you have to place your tile and your networker (optional). There are plenty of decisions to be made in this phase of the game. Do you want to keep extending a conduit, or try to hurry up and close it off because your opponent is also racking up points within it? Do you want to start a new conduit, or keep an open one going? You only have three networkers to use, so do you want to place one this turn, or hold on to it for next turn? Should you close off a conduit so that your networkers are returned to you so you can use them in a more lucrative conduit next round? There’s no shortage of things you can do with your tile and you have to consider not only what benefits you, but what might also hurt your opponent. There’s even strategy involved in choosing your tile at the beginning of the round. You have to balance choosing a puzzle type that you think you can solve with getting a tile that will benefit you (or hurt your opponent). Your best puzzle type may be offering a tile that’s minimally beneficial, while the puzzle type you hate has the best tile. Do you go for the puzzle you know you can likely solve and potentially earn fewer points, or do you gamble on the other puzzle and hope you can win that great tile but get nothing if you fail? The combination of the tile-laying strategies and the puzzle-solving aspect makes for plenty of interesting decisions and keeps the game fresher for longer than either a puzzle or tile-laying game would be alone. It’s a great game for a brain workout. Being “two games in one,” you’d expect a complicated ruleset, but Enigma’s rules are short and easy to learn. The puzzles are fairly intuitive, but there is a primer on each puzzle type if you need help. The rules for tile placement are straightforward as well, with few limitations. Setup is also fast, particularly if you take the time to sort your puzzle tiles after each game so that all you have to do is plop the stacks on the table and go. The game scales well at all player counts. The only notable difference is that, with fewer players, you have a wider choice of puzzle types/tiles available to you each turn. 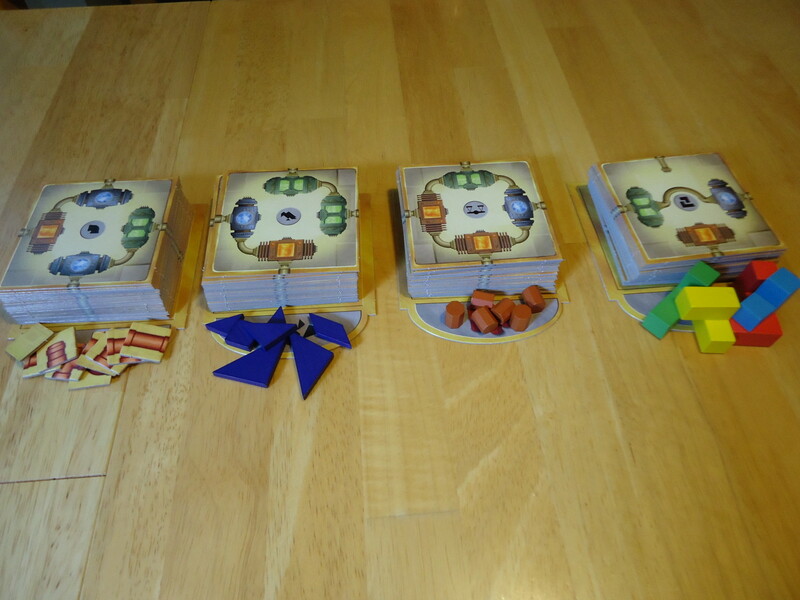 If you are the last player to choose in a two player game, you’ll still have three tiles/puzzle types to choose from. If you’re the last player in a four player game, well, you get what’s left over. This means that in games with fewer players you have more opportunities for strategizing, but there’s nothing crippling about choosing last in a game with more players because you’ll be the first player to choose next round. While Enigma is a solid game, there are a couple of negatives. First, the tiles themselves are a bit disappointing. They are on thin stock that is easily bent, and which can peel and tear if you aren’t careful. It’s not a problem if you’re the sort of person who treats their games with respect, but this isn’t a game that’s going to stand up to much abuse. Second, the theme is pasted on. The directions tout, “Through the power of your creative energy, you shed light on the mechanical shadow world frozen in space. The power cells that you bring to light allow you to discover what secrets are actually hidden behind Enigma’s puzzles. Who will restore the other side of Enigma to life?” It makes it sound as though you’re trying to solve some great mystery, but nothing like that happens in the game. Yes, you are building conduits with power cells, but they never do anything except score you points. No matter how long your conduit or how many points you score, there is no “other side of Enigma” revealed. Enigma is an abstract game and those power cells could just as well be colored dots for all that they affect anything. If you’re looking for theme, it isn’t here. Finally, while the game goes out of its way to be balanced and accommodating, those who don’t like puzzles or who are really challenged at puzzle solving may be frustrated by Enigma. 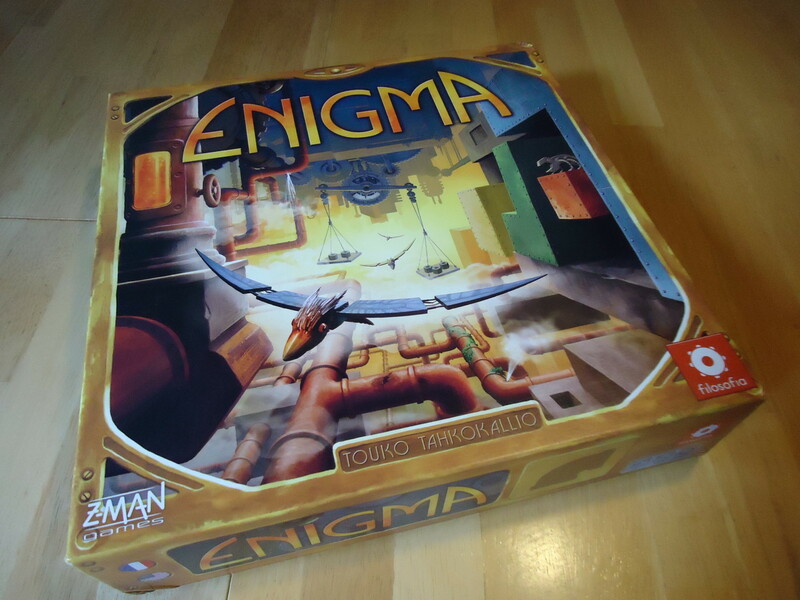 I enjoyed Enigma despite my troubles with puzzles, but I also approached it with an attitude of, “I may stink at this, but at least I’m giving my brain a workout.” Winning and losing were secondary and I was prepared for the worst and pleased when it didn’t happen. Those who can’t approach Enigma with that sort of attitude or who can’t solve even the simpler puzzles may get angry because the possibility is there that they may not earn any tiles and thus lose badly. Overall, I found Enigma to be a fun and challenging game. It’s not something that I’m going to pick up and play on a night when I want brainless fun or loads of theme. However, it is great for those times when I want to give my brain a solid workout without a lot of setup time or fiddly rules to remember. There are enough puzzles to prevent easily memorizing solutions over repeat plays. 'Two games in one' style of play keeps the game fresh and exciting. Short, simple rules make Enigma easy to learn. Puzzle solving aspect is great for those looking to really work their brains. May be frustrating for people who aren't adept at puzzle solving. Thin tiles require care to prevent tearing, bending, and peeling. Theme is thin. Nothing really feels like you are 'shedding light on the mechanical shadow world frozen in space' as described in the rules. Wow, I haven’t even heard of this one. I’m going to have to check it out now…sounds like something I’d enjoy. Thanks for the review!